We all have that bucket list sitting somewhere in the back of our brains, or on that scrap of paper tucked into their desk. Mine is sort of a mixture of these, stored on a drafted blog post, written down on that piece of paper tucked into my desk drawer, and always growing in the back of my brain. On that list you'll see experiences like - dive the barrier reef- go on a hot air balloon ride - and - dogsled. I rang in my 30th birthday knocking one of those items off my list, dogsledding through a snowy white tundra. 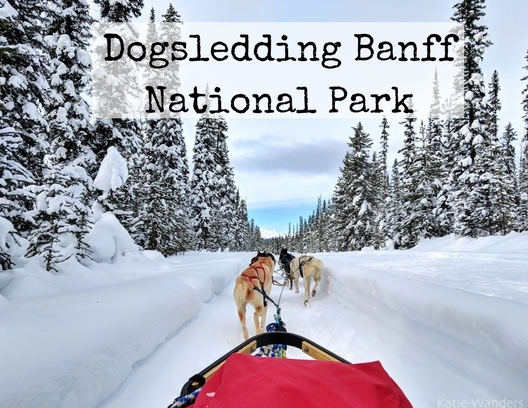 And if you are going to dogsled anywhere, you might as well do it in Canada, through Banff National Park. And heck, why not the day you turn 30. Once I had my heart set on sledding into 30, I didn't want to just go anywhere or with any company. I wanted amazing scenery, history, and a company known for their reputation and care of their dogs. I did a lot of research which led me to three main companies in the Banff area: Snowy Owl, Howling Dog, and Kingmik. Snowy Owl advertised being the most reasonably priced and Howling Dog seemed fine but really sold the experience outside of the dogs (snacks at the half way point, romantic vs adventurer, etc etc). 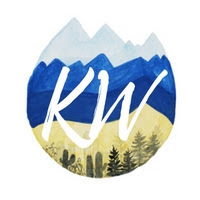 Their reviews were good but I wanted a company that had amazing reviews, really focused on their dogs, followed a scenic route, and I didn't need frills. Kingmik was the only company operating in Banff National Park, and the dogs took us down the old Canada Highway to the Continental Divide where we rode into the next Province, British Columbia. What really sold me were the reviews I read but more importantly, the responses made by the company to various comments and complaints. The owner took the time to respond to nearly every negative review on why things they way they were. Your tour was cut short because you showed up late? Thats because the company had to use different shorter route as you can't turn around a dog sled team on narrow trails. And so on. They were also the most expensive company of the three and I really liked everything I read from raving reviews to see great website. 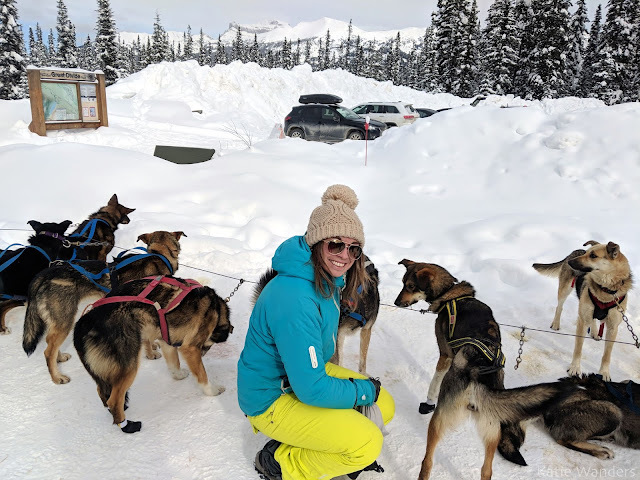 I committed and booked my tour a month in advance and I was excited to join them on my dog sledding adventure. Kingmik has 90 dogs and 11 full time dog mushers. Every sled is guided with no more than 2 (3 if there is a small child) people which amounts to a guest to guide ratio of 2:1, and Kingmik runs no more than 5 sleds per tour time. The guide on my tour, Marc, is a professional guide, guiding dog sled tours in Banff, polar bear tours in Churchill Manitoba, or leading expeditions in Svalbard and Greenland. This guy must really love the cold. His love for the dogs, for the outdoors, and for Canada was apparent and I really enjoyed asking him 6 million questions about dog sledding in Canada. 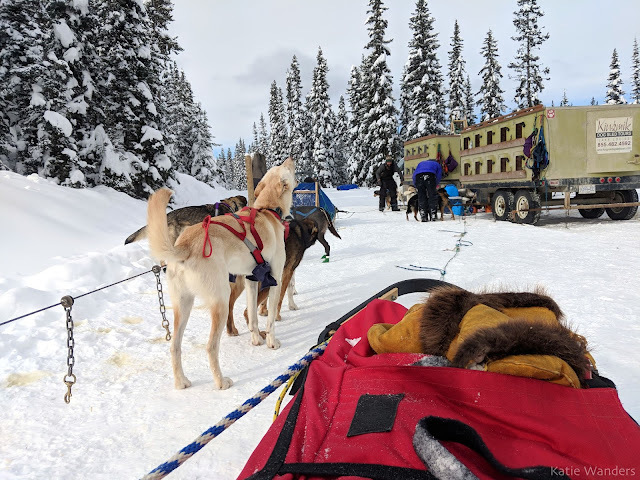 We watched him in action, guiding our team, and even got a chance to stand on the back of the sled to see the "Gee" and "Ha" in action (secret musher words for left or right for the dogs). What do these pups do when the snow melts and the grass grows? From end of April to end of November they return to their summer kennel, a 25 acre piece of land in central BC loaded with trails and lakes. I loved the photos of the dogs enjoying the summer off on their oasis. The dogs on the team were all insanely excited, and no two looked exactly alike. 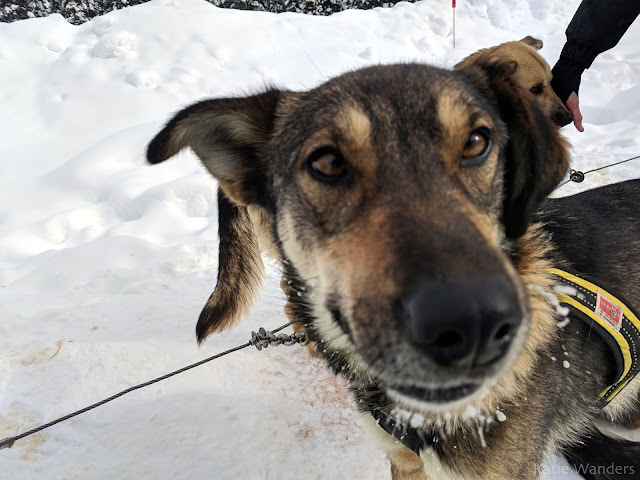 According to their website, some have completed the 1000 mile Yukon Quest or Iditarod, and some are rescue dogs who have been given a second chance. Best yet, some of the dogs are both. When dogs do leave Kingmik, it is into an adoptable home when they decide to retire. The older dogs that do not get adopted live out their lives at the summer compound or wind up in a well suited home. Yes you read that right, you can adopt these beauties when they decide they no longer want to get in their harness. You can believe I was already scheming. An Alaskan Husky is technically a mutt, as they are not recognized by any kennel club as an established breed of dog. They are not bred for looks but instead are bred for that athleticism. The Alaksan Husky is a product of cross-breeding of multiple other breeds to create the best working dog possible. Huskies resemble Siberian Huskies in appearance but alaskan huskies are generally larger and leaner than the similar looking Siberian. I booked the Great Divide Tour, their most popular tour offered. It travels a full 16 km (10 miles) from Banff National Park to Yoho National Park through the Kicking Horse Pass at the Continental Divide. On the return journey your guide will teach you the basics and encourage you to mush your team home. The tour runs about 1.5 hours and the costs depends on when you book. My trip cost $345 for two people on a holiday weekend in February. There were a few other groups at our time slot (maybe 3 or 4?). The groups stick fairly close but we were last to go meaning we had no one behind us. 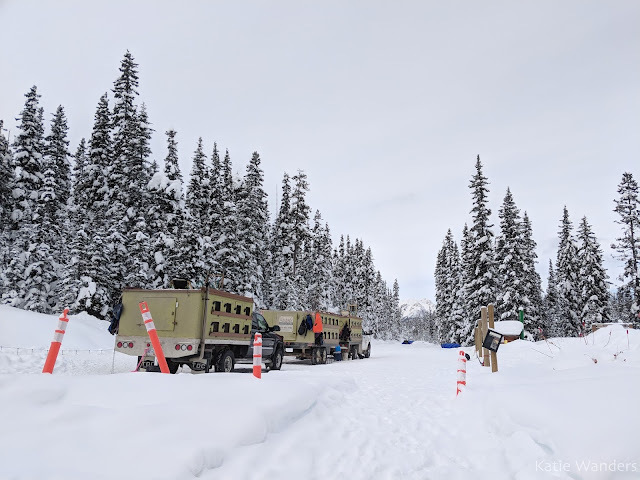 I pulled up to the meeting point by Lake Louise 20 minutes early to check in and spend some time watching the whole operation. The team from the last tour was being fed and watered, and put back in the truck for their nap while the second team went out to play. It was insanely adorable to see the happy dogs who just ran gulping down their dinner and eager to jump into their section of the truck to nap. Note: This is also a popular trailhead for cross country skiers and snowshoers and there was a large parking lot and bathroom. We had a chance to pet and play with the dogs who were very social and loved the attention and pets. We watched the dogs getting in and out of harness, getting their boots on, and getting hooked up to the sled. The moment they all got hooked up to the sled was when the real "chorus" began. The yelping, the howling, and the excitement from these dogs was hard not to smile about. Their job was pulling that sled and it was very clear they loved their job. Everyone was hooked up, everyone started howling, and we were packed into our burrito sled and sleeping bag, nice and warm. 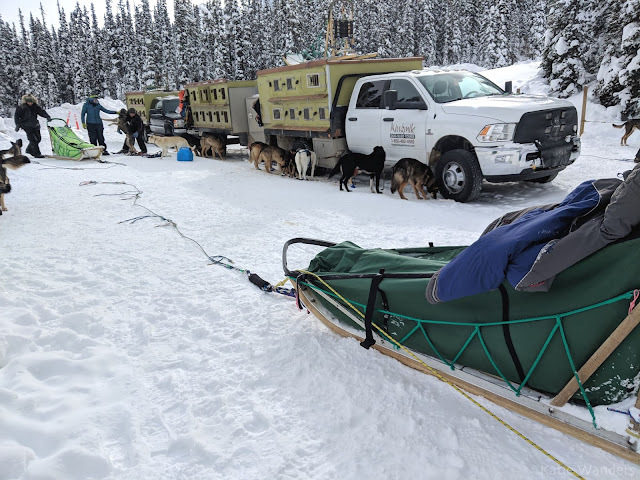 With a quick command and a release of the brake (yep, these sleds have a brake- these dogs want to runnnnn), we were off. The chaos instantly dissipated and it was completely quiet, the only sound being the runners of the sled across the snow. This transition from chaos to sheer quiet was impressive to witness in person. It is hard to really describe this experience and do it justice. There is something magical about being in the woods of Banff, so quiet with so much snow behind a dog sled team. It is so nice to sit in nearly complete quiet, except for the sound of the sled and your musher commanding the dogs. 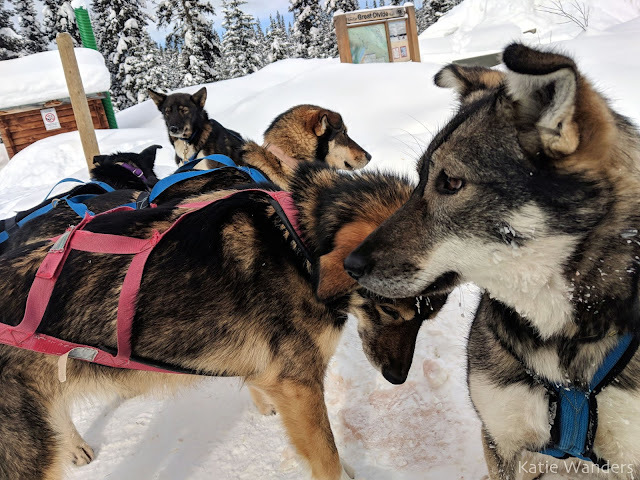 We headed out down the groomed trail (they are not running through deep snow), with our line of dogs pulling the sled with what appeared to look like ease. Itas a winter wonderland down the old Canadian Highway, sledding along until we reached the Continental Divide, and across the border from one province into the next, leaving Alberta to take our sled into British Columbia. 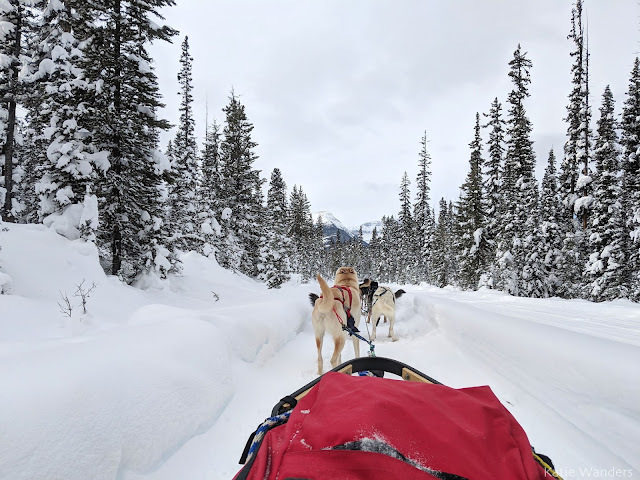 Seven dogs pulling three humans and one sled through the most beautiful winter scenery. 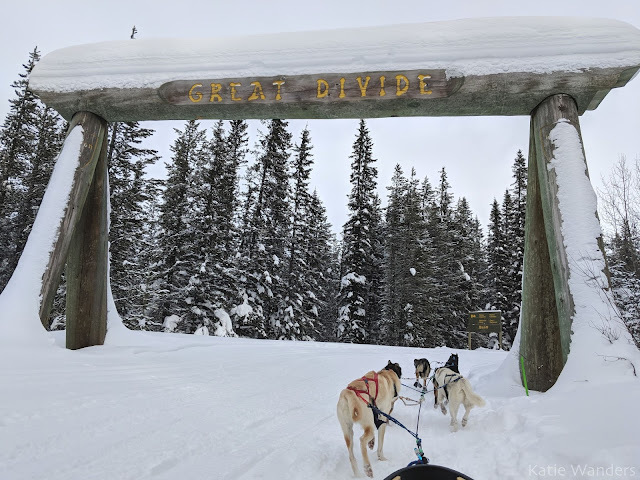 After turning around in a wide section of the trail after the Great Divide, we stopped to take turns jumping on the back of the sled with the musher. Be warned, it is much colder back here but the view and the experience on the back of the sled is worth it. 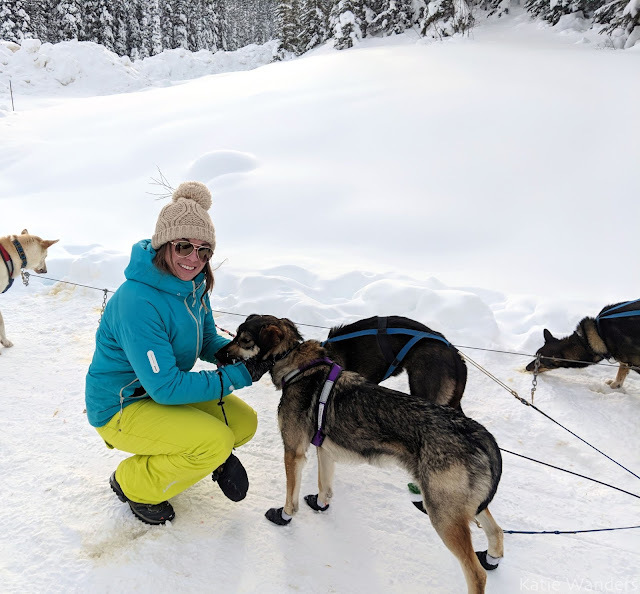 After getting back into the sled, we took the dogs through a section of woods where the scenery changed again, on a narrow trail through the beautiful woods of Banff. 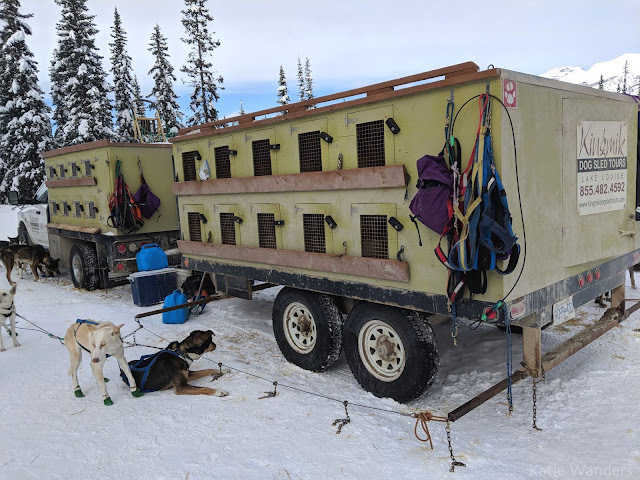 Back at the trailhead, we gave the dogs some extra love, and some raw meat snacks before they were taken out of their harness and were loaded back onto the truck for the drive home. We said farewell for the dogs and heated to the Fairmont to warm up inside with a coffee and a brownie. I feel incredibly lucky that I could spend my 30th birthday in somewhere as beautiful as Banff, doing something as unique and dog sledding through one of the most beautiful National Parks I have ever seen. I highly recommend the experience of Dogsledding but urge you to do your research. We had a great experience with Kingmik and I would highly recommend this operation if you find yourself in Banff on a snowy winter day. This sounds so amazing! I especially love that the dogs enjoy their job. I think a lot of people out there who question using animals for work (like these dogs, or even our riding horses) don't understand that the animals really do enjoy it too. Thanks for sharing! I've been waiting for this post! I agree 100 percent! As someone who has horses we have to look at all sides. Are all horse owners great? Nope. Are all dogsled operations perfect? Nope. Just have to do your research. Well respected company and how much these dogs loved their jobs was so easy to see. They are out on the trails exercising and love having a job! They are also well well loved by their habdlers. There are so many anti dogsledding people our there but after doing research (aka the cheapest option isn't always the best....) We can have amazing experiences like this and support a great sport. Thanks for your comment !